Jamestown Regional Medical Center (JRMC) Foundation is now accepting nominations for the 2013 Philanthropist of the Year Award. Nominations for this award must be received no later than August 17. The following criteria should be displayed by the nominee: support of individuals (or couple’s) direct contribution to and support of JRMC/JRMC Foundation, accomplishments in healthcare, participation in and support of other non-profit organizations in the community or region, data of personal involvement in leading others to be involved in philanthropy or community volunteer service. The nomination must be submitted in a concise essay (no more than two pages) noting the above criteria. A cover sheet provided by the JRMC Foundation must be included with the submission. The Philanthropist of the Year award will be presented at the Pillars of Giving donor appreciation event on September 5 at the Gladstone Inn & Suites. For more information on the Philanthropist of the Year Award or Pillars of Giving donor appreciation event, contact the JRMC Foundation at foundation@jrmcnd.com or (701) 253-4806. Jamestown Regional Medical Center Foundation held its annual GOLF “fore” GOOD tournament on Friday, July 19th at the Jamestown Country Club with title sponsors The Davis Group, IRET Properties and Timco Construction. The proceeds from this year’s tournament went to support new technology and equipment for JRMC by helping to reach the goal to purchase a DEXA (Dual-Energy X-ray Absorptiometry) machine. This equipment helps support the early diagnosis of osteoporosis along with total body composition scans. 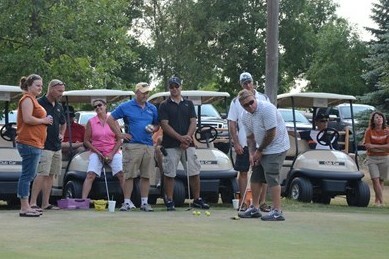 More than 120 golfers enjoyed the four-person scramble tournament. The highlight of the day came when Brady Schoeler was just inches away from a hole-in-one for Wilhelm Chevrolet Buick GMC’s car give-a-way on hole four. “We could not have had a successful event without the support of our sponsors, community, vendors, staff and volunteers,” said Lisa Jackson, JRMC Foundation Director. The tournament raised $33,994 dollars. There were over 55 team and tournament sponsors which helped raise these funds. Over $30,000 in prizes and gift certificates were given away to the participating teams. The winners of the tournament were as follows: first place was BrandomActs with Heather Erholtz, Glen Hasselberg, Derek Hasselberg and Cydney Hasselberg; second place was Argent Farms with Reed Argent, Jim Argent, Ross Argent and Ryan Voxland; draw from the remaining team was Timco Construction with Eric Kobeska, Jeff Mauder, Russ Miller and Mark Ward. JRMC Foundation would like to thank the following lead donors for their support: The Davis Group, IRET Properties, Timco Construction, Ottmar & Ottmar PC, Wilhelm Chevrolet Buick GMC, R.M. Stoudt, Ingstad Family Media, Community MRI Services and Mr. Bob Letcher. 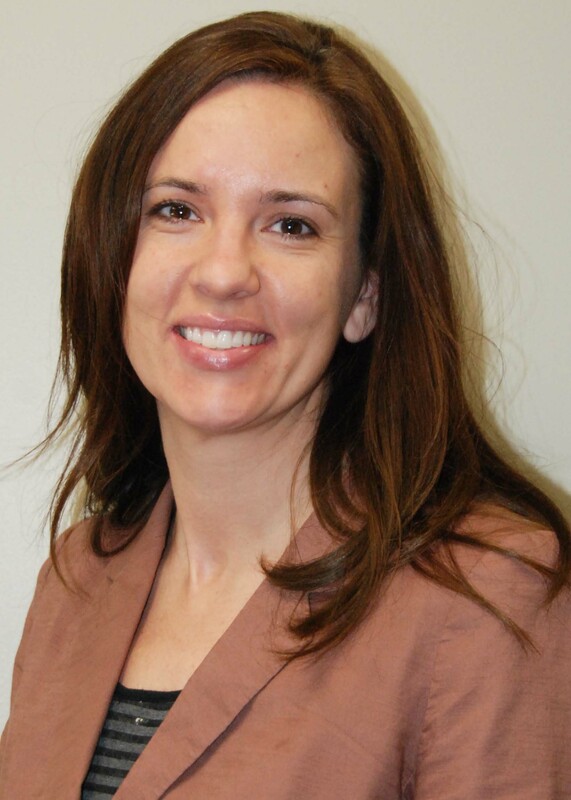 Jamestown Regional Medical Center is pleased to announce that Lisa Jackson has been named as the JRMC Foundation Director. “Lisa has great experience in working with non-profit organizations and we look forward to her taking our Foundation to the next level.” stated Todd Hudspeth, JRMC CEO. 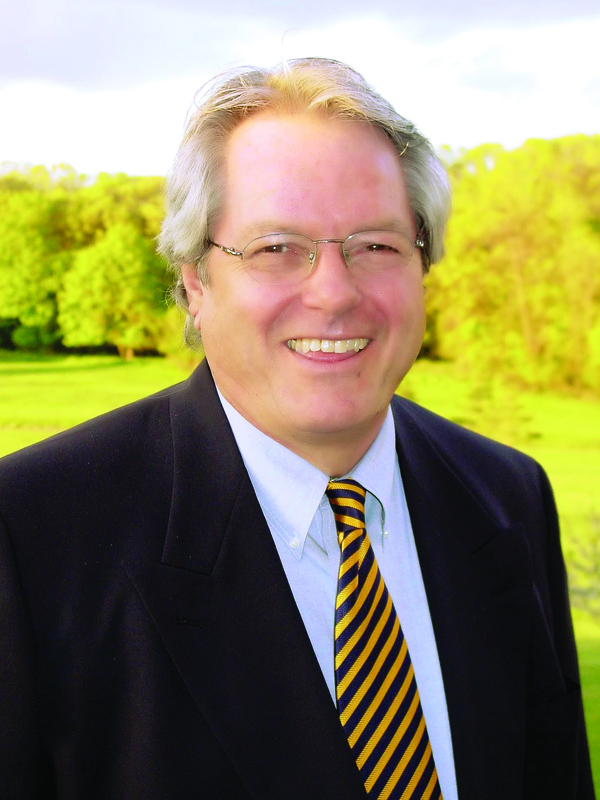 Jackson graduated from NDSU with a degree in mass communications and has worked in marketing with Newell Rubbermaid, annual giving and events for Jamestown College and major gift and gift planning for Kansas University Endowment. She is the co-founder of GivingPoint, a fundraising consulting firm and helped launch Today’s Giving, a philanthropy magazine. Most recently, she has been an independent fundraising and communication coach to area non-profits. She has a two year old daughter, Hadley and is married to Dustin. Lisa will be responsible for planning, organizing and implementing strategies to achieve successful development of the Foundation. 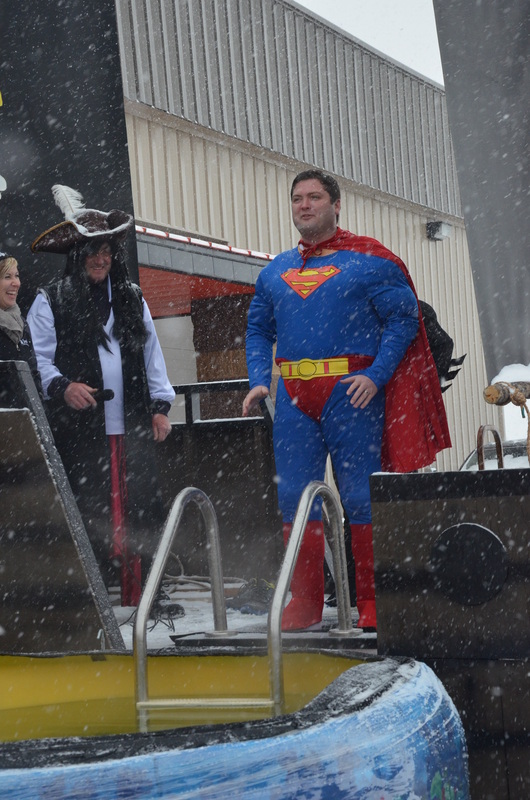 A beauty queen, a firefighter, superheroes, clowns, kids and a giant parrot all leaped into water on a snowy day to earn $19,000 for Jamestown Regional Medical Center’s hospice program Saturday in the Polar Pig — Walk the Plank fundraiser. “That’s the biggest amount of money we’ve ever made for them, and we’ve been doing it for seven years,” said Jan Wiese, treasurer of the Jamestown HOG Chapter that organizes the annual fundraiser. “We were very pleased with that.” Sixteen people jumped into the heated water to benefit hospice, as snowflakes fell and HOG members set off fireworks, simulating cannon fire. Each jumper then had to brave the 13-degree air to get back into the Stutsman Harley-Davidson building, changing out of soaking-wet costumes to warm back up. “It was warm in there, but it was cold getting out,” said MacKenzie Johnson of Jamestown. Johnson, who earned the title of Miss North Dakota Junior High, jumped into the water wearing a teal formal gown and a tiara, after raising $130 for JRMC Hospice. Dennis Sand, also known as “Fluffy the Parrot,” wore a parrot costume and face paint for his jump. As soon as Sand cannonballed into the water, the costume filled with water, making it difficult for Sand to stand up again. He and the Jamestown Clowns raised $1,020 for JRMC Hospice. Members of the Kaiser family made the watery hop together — first Cruze Kaiser, 6, followed by his father, Chad Kaiser, who held out his arms to his daughter, Mia, 4, who wore pink goggles, a purple tutu and matching purple shoes for her jump. Before the event began, Mark Wiese, director of the local HOG group, said he hoped to exceed the previous year’s total of $17,000. 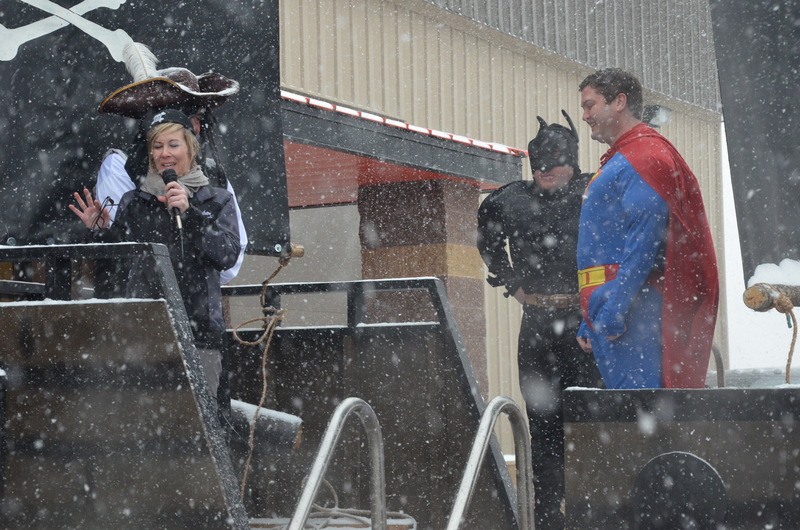 In addition to the plankwalking, the event also included a chili cook-off featuring a wide variety of chilis. Most seemed to have beans, but some had chicken or even olives as ingredients. Then there was a silent auction, with cocktail sets, purses, gift baskets, salon products, live plants, framed oil paintings, a 1997 Pontiac Grand Prix and a set of two cheery lawn gnomes outfitted in Harley Davidson gear. 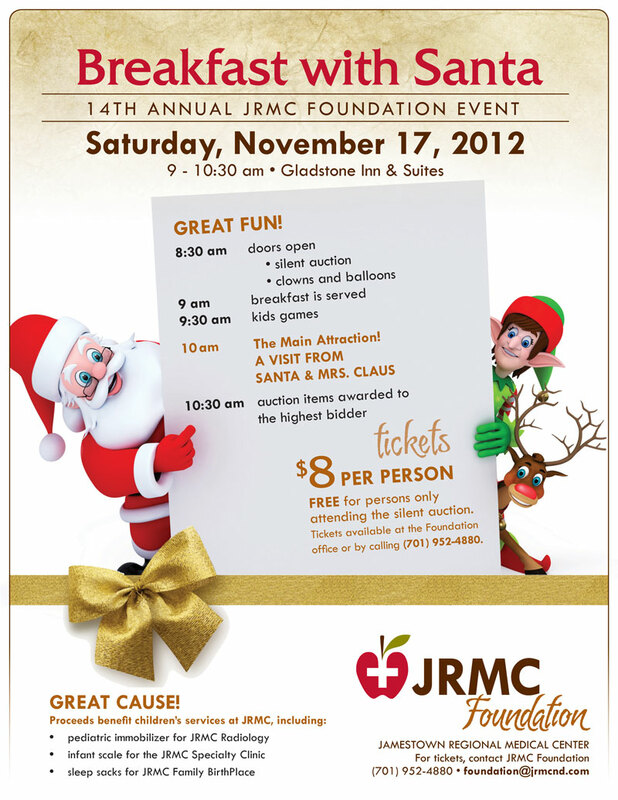 Jamestown Regional Medical Center (JRMC) Foundation will host their 14th annual Breakfast with Santa on Saturday, November 17 to raise money for children’s services at JRMC. Families are invited to enjoy a fun filled morning with breakfast served by Santa’s elves at the Gladstone Inn & Suites. The doors open at 8:30 am and breakfast will be served at 9 am. Santa and Mrs. Claus will make their appearance with gifts for the children. “Over the years, we have obtained many items for children’s services at JRMC. This year we are raising money for a pediatric immobilizer in the Radiology department, an infant scale for the Specialty Clinic and sleep sacks for the Family BirthPlace to help eliminate SIDS,” stated Foundation Director Jan Barnes. Entertainment for this year’s event will be children games. As always there will be a silent auction. Tickets are available for $8.00 and can be purchased at the JRMC Foundation or by calling Penny Holland at (701) 952- 4880.